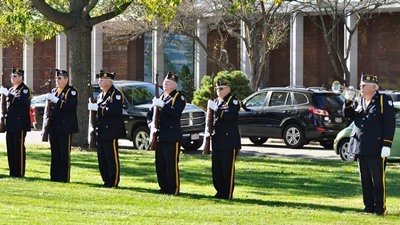 Middletown, OH Local 1943 President and Directing Business Representative Neil Douglas honored the service and sacrifice of Ohio veterans and active duty service members at a Veterans Day ceremony held at Woodside Cemetery in Middletown. The annual event is the result of a joint effort of the Veterans of Foreign Wars of the U.S. (VFW) Post 3809, American Legion Post 218, and the Middletown Veterans Memorial Committee (MVMC) Veterans Day Memorial. Douglas, a veteran and Chairman of the MVMC, and lifetime member of the VFW, represents IAM members employed at AK Steel, Pilot Chemical, RMB Transportation and Cummins Bridgeway. Middletown, OH IAM Local 1943 members raised $30,000 to build the Veterans Memorial at Woodside Cemetery, where it honored military veterans during a joint annual Veterans Day ceremony. 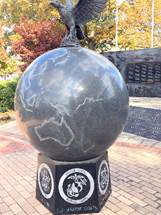 Pictured is a monument with an American eagle perched upon a globe that was donated by the local. Each year, Douglas and Local 1943 staff and members also play an important role in the annual Veterans Memorial Scholarship golf event, which helps area veterans and their families further their education. Local 1943 has a long history of supporting veterans that stretches back to 1914 when workers in Middletown volunteered to form the Armco Ambulance Corps, a detachment of workers supporting front line troops in World War I. Current IAM members of Local 1943 support veterans and active duty personnel with payroll donations and by raising $30,000 to build the Veterans Memorial at Woodside Cemetery in Middletown. International President Bob Martinez issued a Veterans Day statement thanking the men and women of the U.S. and Canada who have served their countries through military service. The IAM Veterans Services Department has valuable resources available to vets. Anyone interested in the Veteran Service Program please contact General Vice President Diane Babineaux’s office at 301-967-4505. Feel free to pass along information and pictures of events pertaining to veteran IAM members to dbabineaux@iamaw.org. If you are an IAM military service veteran and haven’t filled out a contact information sheet, please do so.